Weight loss is often on the forefront of our minds. Diet and exercise both play important roles in weight loss. As it turns out, diet and exercise also play important roles in maintaining good oral health. Let’s look at a few examples. Better food choices. As you choose healthier foods for your body, you are actually choosing healthier foods for your teeth! Foods high in carbohydrates contribute to tooth decay. A diet low in sugars and processed carbohydrates both help trim your waistline and prevent cavities. Drinking more water. Drinking water helps control calories. Many people reach for sugary beverages to drink throughout the day. These beverages are high in calories which affects your waistline and are high in sugar which affects your teeth. Water often eliminates hunger cravings and does not contribute to tooth decay. Eliminating soda. Sodas are loaded with sugar. If you consume too much sugar from sodas or other sweets, you are at increased risk of being overweight. 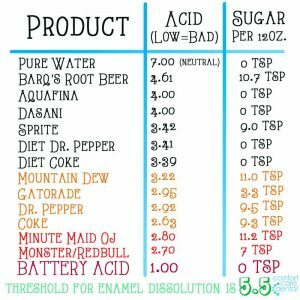 The sugars in sodas, as well as the acids, also greatly contribute to tooth decay. Eliminating sodas significantly decreases your sugar intake to facilitate weight loss and promote good oral health. Regular Exercise. Exercising regularly helps decrease your chance for heart disease. By decreasing your chance for heart disease, you are also decreasing your chance for diabetes. Diabetes causes patients to be at greater risk for periodontal disease. Toothbrushing. Nothing makes food taste worse than eating after you have brushed your teeth! Brushing your teeth after your last meal of the day helps stem cravings and prevent late night snacking. We at Adams and Cheek Dentistry are always here to answer any questions you have regarding your teeth or overall health! Feel free to contact us by clicking here or call 919.866.1630 with any questions or to schedule an appointment!